Anyway, Make Up For Ever Star Powder fall into the category of loose powder eyeshadows. They come in little tubs with a sifter and a clear cover so you know what the colour is. It is useful, but depending on how you store it, you risk spillage. I store mine on the side – there are too many to stack, so the powder does collect and spill if I’m not careful. So, what I do is tap them on the cover to settle the powder before opening the cover. This way I don’t spill any or spill little. The texture of the Star Powders are divine. Very smooth and fine milled and the shimmer is outstanding. If you don’t like products with shimmer, perhaps now would be a good time to stop reading because Star Powders are all about shimmer. Not glitter though, just fine shimmer. 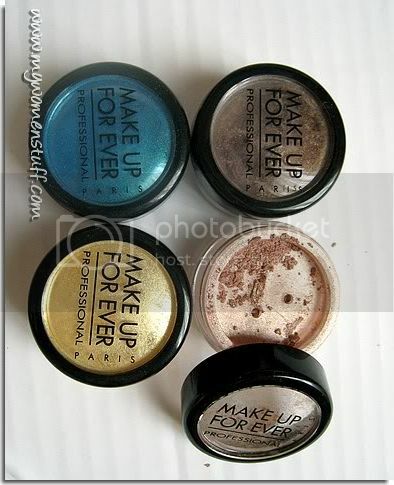 Colour wise, Make Up For Ever Star Powders are highly pigmented. See that turquoise blue in the picture? I can only use a tiny tiny touch of it or risk looking like a drag queen! Yet Star Powders can be used on their own or dusted over other eyeshadows to bring out the colour and add shimmer. If you are using Star Powders on top of another eyeshadow, you can dust some of the more neutral shades over your eyeshadow to add shimmer and draw attention to the eyes. This is a great tip for night makeup. You can also mix this into gel or Eye Seal to turn them into eyeliners and dust these magical powders elsewhere on your face or décolletage. Or maybe mix it into foundation or loose powder to add a touch of highlight on the skin. Anywhere you wish to add shimmer. Well, except that blue of course… 😉 Or mix it into lipgloss and get your own custom made gloss. The possibilities are endless. I however, stick to using it on the eyes. 😛 I’m boring that way. There are lots of colours to choose from, although Make Up For Ever counters in Malaysia don’t stock many depending on the stock. Its a shame really. The counters in Hong Kong are outstanding! (Facesss in Harbour City and Seibu in Tsim Tsa Tsui were 2 I went to) I currently have something like 6 with only 1 lime green (surprise surprise!) shade. But there is one thing I dislike about the Star Powders, and most of Make Up For Ever products. They use numbers for reference instead of names. I can never remember numbers! Also, sometimes the number referred to only has 3 digits when the actual product has 5 digits (they reference it with the last 3 digits). Endless confusions. Otherwise, this is a star product for sure. Oh and one little tub will last you a life time. I’m sure it’ll last me mine! A tub of Make Up For Ever Star Powder costs RM65 at Make Up For Ever counters in KLCC and 1 Utama and Sunway Pyramid (Malaysia). (It is available at Sephora in the USA and retails for US$18) MUFE needs to start coming up with more counters in Malaysia or lose their marketing edge, which will be a pity because they do have some good products. I really need to give these a go! Will be checking it out when in HK! I honestly do wonder how it plays against those sparkly MMU e/s! Is there any difference? Okay, reading beauty blogs is doing no good to me. My shopping list is getting longer and longer, and I just keep wanting to buy more stuff! I agree with MisSmall. You writing about all these lovely eyeshadows are no help at all to our purses! LOL. But have you tried the eyeshadows from the Makeup Store (I think I got the name right)? It’s a very MAC-ish looking store. I took swatches once just to see how pigmented the e/s are, and they’re beautiful! Didn’t get anything tho. Any idea how these compare to them? you can get MUFE in Sunway now, for all the places!!! but MUFE is changing as I keep telling them to stock up and so now Star Powder is rather OK! 😛 But of course you get the best choices if you go to KLCC. Star Powder used to have only 3 digit numbers (old packaging) and then when new one came (along with the new system for all its products) and thus added 90 in the front. so if it was 904 it is now 90904. Simple. I am a person of numbers instead of names. LOL. Please recommend the color for daily use. @Monstro : Why not just check them out here? 🙂 I like 90926 (champagne), 90919 (dark plum) and one apple green shade I haven’t yet bought but have been looking at. I might be entirely off course in my numbering – i hate numbering systems. @Nikki: Yes there is. I find that MMU is not as sparkly and never as fine as MUFE Star Powders. Personally I haven’t found a MMU eyeshadow I liked but thats me! @MissSmall: LOL… restraint is key! But I hope you dont run away! @Syen: I have tried the Make Up Store but I did not buy anything from them. The eyeshadows are very MAC in look and feel and I liked the texture of some of them. Their loose powder eyeshadows too are really nice but somehow I just never got anything! @kris: I guess it depends what you mean by daily use because I can use all the colours daily! The best everyday shade would probably be that champagne shade which is 90926 if I recall correctly. Goes with everything and is awesome at night.